Our mission at Kinsey Chiropractic, is to treat patients with compassion, respect and understanding. Dr. James Kinsey and the Kinsey Chiropractic team take pride in offering state-of-the-art natural health care. Our goal is to provide more than symptomatic relief, but to help achieve optimal health for many years to come through regular chiropractic care! Chiropractic helps with so much more than traditional back and neck pain, it can help alleviate symptoms experienced from a variety of conditions. Here at Kinsey Chiropractic, you can expect to receive the individual care you need to help you get well and stay well! We provide quality chiropractic care to Kissimmee, St. Cloud families in hopes of improving their long-term quality of life. Our Kinsey Chiropractic team is ready to lead you on your journey toward health through chiropractic care! Take some time to browse our website and then give our Kissimmee chiropractic office a call to get started with chiropractic care! 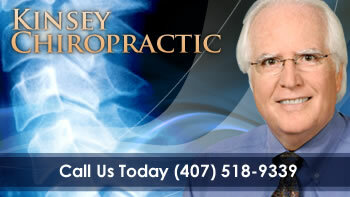 Quality chiropractic care for the Kissimmee, St. Cloud and Orlando areas. I am very impressed with Dr. Kinsey. He has done an excellent job relieving my pain. Feel very confident in the care I received. The best staff and treatment around. Courteous and caring staff, helped me back on my feet again. Dr. Kinsey was very informative and did an excellent job at evaluating my needs as a patient. I wish all physicians took the time to examine and explain options with their patients as did Dr. Kinsey. I would certainly recommend him to others.